Thomas Coughtrie was credited by the Times as the inventor of the Mole wrench, a gripping device that was manufactured in Newport and given prominence by the Council as a unique selling point on postmarks (see above). The invention is in dispute but it could be surmised or presumed that Coughtrie's company, M. K. Mole and Son produced their own version (the Mole Grip) originally in Birmingham based on the existing American Vise Grip. The likeness between the two is clear from sketch drawings. In 1947 Coughtrie started working for the Birmingham engineering firm 'M. K. Mole and Son', founded in 1835. When the second Mole brother died in 1950 he became managing director of the company. 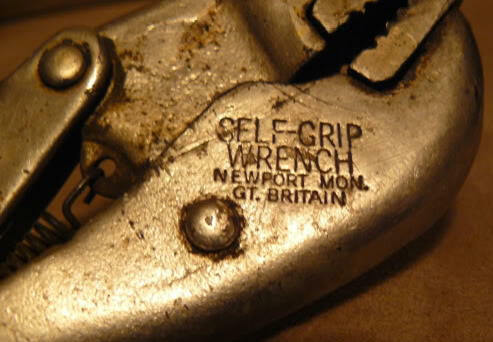 In 1955 he patented the self-grip wrench. In 1960 the Mole company, and Coughtrie, relocated to Newport. Their Mole Molynx factory was adjacent to the eastern entrance of the Brynglas tunnel on the M4. A message always used to appear on the roof from Mr Mole. Coughtrie became a director of Cwmbrân New Town, governor of four local technical colleges and, in 1978, deputy lieutenant for Gwent. Their literature stated "The Mole Self Grip Wrench was a product of M. Mole & Son Ltd, Crindau Works, Albany Street, Newport Mon in the Uk. Their literature states the company was established in 1835 -but they started making these in 1955 - available in 7" and 10" straight and curved jaw models - a table clamp was available to make them into a portable vice." In a letter to the Guardian 22/10/12 regarding boastful/hopeful towns (Letters, 19 October), Gareth Pritchard of Daventry wrote "I fear none come even close to the proudness displayed by the good burghers of Newport on their signpost at the entrance to the town: "Welcome to Newport – home of the mole wrench."